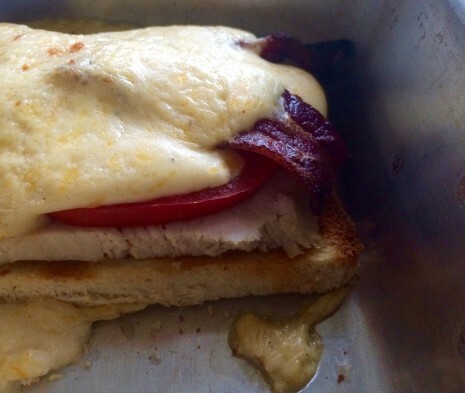 THE HOT BROWN: REASON ALONE FOR LEFTOVER TURKEY | Jane Lear. Writing on Food and Travel. Back in the day, a college pal we all called Kentuck introduced me to the Hot Brown—an open-faced turkey sandwich embellished with tomato and bacon or country ham, draped with a rich cheese sauce, then broiled. He was working with nothing more than a hot plate and a toaster oven, but somehow he managed to serve it with the same élan as I imagine its creator, Fred K. Schmidt, chef at the storied Brown Hotel, in Louisville, did in the 1920s, when he needed to feed famished late-night revelers after dinner dances. There are a number of variations to choose from. Sometimes chicken takes the place of turkey. Sometimes the bacon is enrobed in sauce, sometimes it rides on top. Sometimes thin slivers of salty, pungent country ham (Benton’s, Edwards, and Kentucky’s own Newsom’s are my favorites) are a time-honored substitute for the bacon. You get the picture: Pretty much, it’s all good. What I wouldn’t skip though, is the tomato. You can still find decent vine-ripened ones around, and just a slice adds the acidity you need to balance the overall lushness. The cheesy sauce that unifies the sandwich’s elements is a takeoff on a classic Mornay sauce, itself a gilding-the-lily derivation of a béchamel, the mother of all white sauces. In some recipes, the sauce is enriched with an egg yolk or whipped cream, but why not keep it simple? The real key to success, after all, is in the simmering, which further cooks the roux (the mixture of flour and butter that acts as a thickener), thus turning the resulting sauce voluptuous and satiny. You don’t have to tell anyone how quick and easy it is to make. Hot Browns make an excellent brunch dish for weekend guests, but I must admit I like them best after all the socializing is over and it’s just the two of us, eating Sunday night supper in front of the television. Bliss. Happy Thanksgiving! We are all so fortunate. Depending how hungry or greedy you are, this serves two to four. Add a crunchy green salad and a glass or two of something crisp and dry, and call it a day. 1. Melt the butter in a smallish saucepan over moderately low heat and cook the onion in the butter until it’s softened, about 2 minutes. Stir in the flour and cook, stirring, for 3 minutes to make a roux. (Don’t rush this step; the cooking eliminates the raw flavor and pastiness of uncooked flour, and it also primes the flour particles to absorb liquid to their fullest.) Add the milk in a steady stream, whisking constantly, and cook until thick and smooth. Add the cayenne and season with salt and pepper. 2. Increase the heat and bring the sauce to a simmer; simmer, stirring occasionally, until thickened and velvety, 10 to 15 minutes. Pour the sauce through a fine-mesh sieve into a bowl and add the Sherry, if using, and the Cheddar, stirring until smooth. 3. Preheat the broiler. Put the pieces of toast in a flameproof (i.e., not Pyrex) baking pan and top each piece with turkey and a tomato slice. Crisscross 2 pieces of bacon on each open-faced sandwich. Spoon the sauce evenly over the sandwiches and sprinkle with Parm. Broil sandwiches until sauce is bubbling and lightly browned, 2 to 3 minutes.